리우데자네이루의 코파카바나 해변에서 단 500m 거리에 있는 Hotel Bandeirantes는 에어컨을 갖춘 객실과 옥상 수영장을 보유하고 있습니다. 편의 시설로는 헬스 클럽, 사우나 등이 있습니다. 무료 WiFi도 제공됩니다. 아름다운 현대적인 인테리어를 갖춘 이 3성급 호텔은 밝고 넓은 숙소를 제공합니다. 현대적인 욕실, 플러스 케이블 TV, 전화기, 미니바도 구비하고 있습니다. 룸서비스도 이용 가능합니다. 고전적인 그림으로 장식된 쾌적한 공간에서 다양한 열대 과일, 주스, 빵과 케이크로 구성된 조식 뷔페를 즐길 수 있습니다. 단품 브라질 요리는 점심과 저녁 시간에 제공됩니다. 바에서 이국적인 음료도 즐겨 보십시오. Hotel Bandeirantes에서 시케이라 캄푸스 지하철역은 550m, 코파카바나 항구는 2.2km 거리에 있습니다. 산투스 두몬트 공항은 8.7km, 갈레앙 국제공항은 25.5km 떨어져 있습니다. 주차 공간은 이용 가능한 경우에 한해 유료로 제공되니 참고하시기 바랍니다. 이 호텔은 체크인 48시간 전부터 신용카드를 사전 승인할 수 있는 권리를 가집니다. The hotel placed in a good location! Theres nothing to eat in the breakfast and theres nothing fresh! The reception wasn't professional at all! We almost missed an organized trip cause they didn't inform us that they changed the hour! Everything that you buying ( trips or taxi) outside so the hotel makes you faces and not inform anything and not supporting!!! They even charge us on water that we didn't drink cause they said that the top of the bottle was open!! !and we didnt even used anything! My girl friend called to the reception to ask something and they answer and hang up on her face! This is not hotel this is more hostel! We are really disappointed of the service and the hotel! I will never stay there on my next trips! I like everything about this hotel. The staff are very helpful with good command of English. Though hotel room is small but it was good enough for 2 persons and this hotel serves good breakfast. With the Copacabana beach 2 block away (5 min walk) and subway station within 5 min walking distance, it is very easy to travel around. Surely will stay in this hotel again in future. This hotel is comfortable and convenient for Copacobana but has seen better days. I have been staying here for 10 years and have always found it to be good value, but it seems to be getting more expensive (like everything in Brazil)and I don't think the rooms have been updated at all in that time. The breakfast buffet is great, however. I would recommend it if you don't know the city and want a safe bet, but I think next time I might look around and see what else there is before choosing this hotel again. ok hotell men priset kanske i overkant for vad man egentligen far. trevlig personal, fint rum och god frukost. liten pool dock uppe pa taket. Good location Nice rooms Excellent breakfast The reservation staff fool you by giving wrong commitment. I wanted to stay till 11 pm as I had 3am flight back home. I requested them, and they said that I have to pay for half day and can have a late stay... At 7pm in evening, when I was going out of Hotel, the reception guy told me that my hotel chk out time was 6pm, and if I overstay any extra hour he will charge for the whole day... That was absolutely cheating... After all, why would I pay 120 BRL just for 5hrs? I took the room because it was among the cheapest in Copacabana. No complaints. The breakfast was good. The only reason anyone booked this place has to be because it was the cheapest option available in Copacabana. Many similar type outdated hotels like this in Rio. They're to be avoided, but if you are stuck for a place to stay for one night, then at least ask for a quiet room at Bandeirantes. mole eye view, but at rear on ground level it was quiet. Hotel charges 20 centavos a minute to use their wifi: that's more than $7 an hour. Opted for a twin bed room to hedge my bets, and sure enough: one was rock hard and the other mattress was like a bean bag. In fairness, for a 1st time visitor to Rio, you could do worse than this one, though doubt anyone would stay here again on a repeat visit to Copacabana. paying to use the safe in my room... should be free. I was pleasantly surprised with our experience. The breakfast was very good, the room was clean, and the location was nice. The swimming pool on top of the room was very small, but being five minutes from Copacabana, how much time are you going to sit around the pool. The pool did provide a nice view of Corcovado. There was a great sandwich cafe... Big-Bi (great burgers and acai juices) about 50 meters from the hotel and an authentic Italian gelateria (delicious) about 50 meters from the hotel. My wife had a great time talking to the older owner about his Italian/Brasilian Portuguese accent. This was our third time to Rio and our first time here at this hotel... we were very pleased. Also, the vibe around the hotel felt very safe and it is a little more residential and as such the shops and cafes are a little more affordable and of better quality. Cheap, rooms are basic but nice (better than a lot of the average hotels in copacabana) and breakfast is nice. Location is fine. Attitude of the staff... noisy rooms. Expensive Internet. It's Copacabana... so you can't find cheaper than 180-200 reais... and nowdays, thats more than 100 USD a night. Hotels have 21st century prices but the quality is still in the 1970's or 1960's. Bandeirantes is not a bad hotel... good breakfast, basic but nice rooms and O.K. location. And the price makes it one of the best options in this side of the town. I have seen worst and more expensive hotels around here. But this is a place to stay only a couple of days... not more than that. 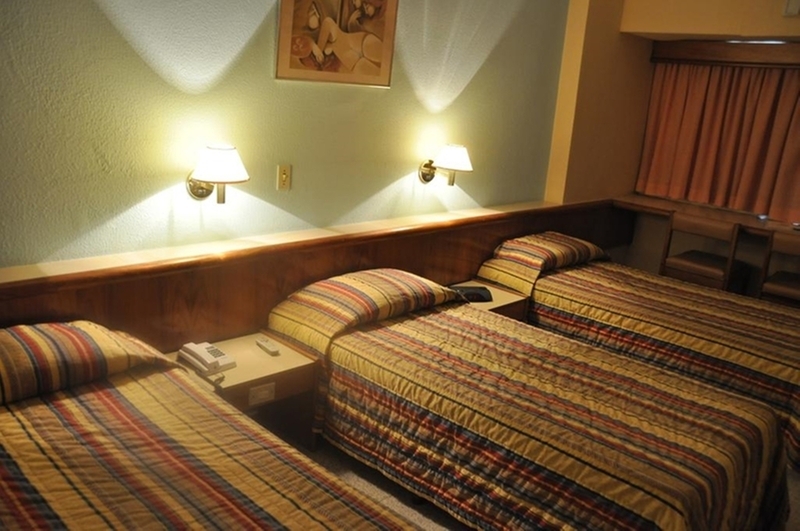 The hotel has an excellent location just three blocks from Copacobana Beach. It was clean and comfortable. It had an excellent Brazilian-style breakfast buffet. The swimming pool and the fitness center are smaller than they seem in the photos. They are both tiny. The website claimed that there was free parking, but in fact they charged R$35 for parking. 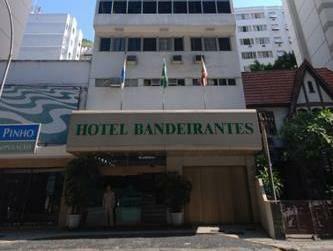 The Hotel Bandeirantes served perfectly for our overnight stay in Rio. 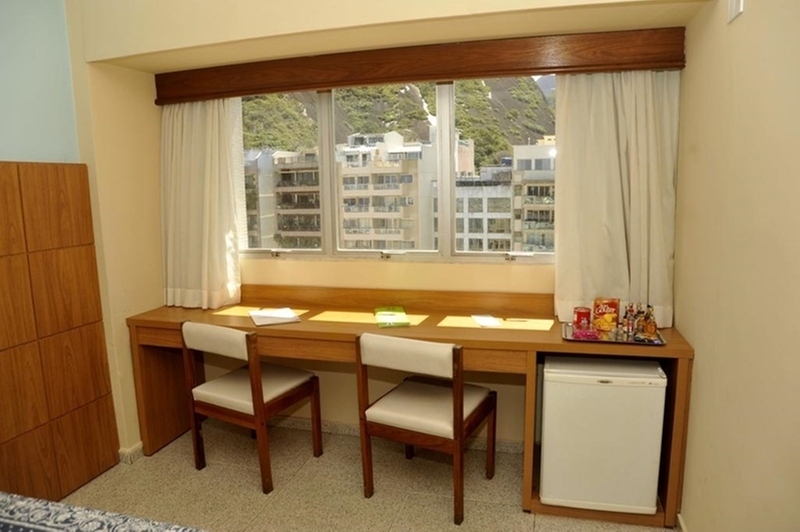 It is close to Copacabana Beach, the Pao de Acucar, and other Rio attractions. The excellent breakfast buffet gets you off to a good start. Someone should correct the website that falsely promised free parking, but other than that the hotel met our expectations at a very reasonable price. very small tv and very high. The hotel is a nice hotel, 5-10 minutes walk to copacabana beach. It is a clean hotel, the room is quiet and have a nice view of the mointains. The problem is the tv that is very small and it is located very high on the wall. The breakfast is a plus. All service workers were very helpful. The front desk advised us when our plans would have taken us to an unsafe area instead of just giving us the directions we requested. Breakfast was nicer than other places we stayed, with good variety. Close to bus lines, though they were not part of the hotel network that allowed free bus travel to certain locations. The street noise and room size were acceptable given the location and price. 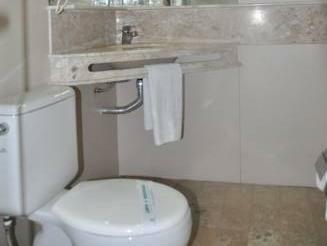 Tourist friendly hotel with friendly and hospitable employees. Very nice breakfast. limited english channel on TV. My wife and I will never forget our last trip to Rio de Janeiro because of our stay at the Bandereintes Hotel. Reasondably priced room and very nice breakfast. The place is near to all tourist destinations i.e. beaches, shopping centers, tourist places like Corcovado, Macarana and Pao de Azucar ets. 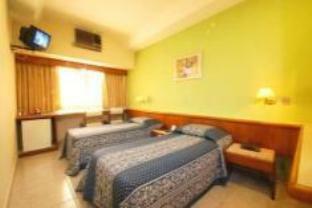 The room is clean and very comfortable with nice hot water shower clean bedsheets and ref full of snacks and drinks. Chambre propre et confortable; breakfast copieux et genereux; personnel aimable en general; hotel bien placé et calme; s il y avait a faire une critique, les murs des chambres semblent en papier; on entend les voisins a profusions ; farfois c est interessant , parfois non. vieille chambre, clim tres bruyante, télé brésilienne, mieux vaut une possada plus simple mais plus sympa,propre...et trois fois moins cher dans le meme quartier! petit dej bon et copieux.